The Indonesian radio industry and regulator have selected DAB+. With a population of more than 237 million people the adoption would make it one of the largest DAB+ markets. 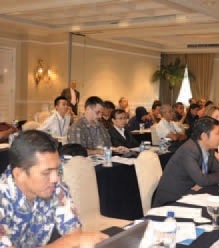 WorldDMB with the Asia Broadcasting Union (ABU), the Ministry of Communication and Information Technology of Indonesia (KOMINFO), Radio Republik Indonesia (RRI), and Commercial Radio Australia (CRA) organised a successful four day DAB+ Technology Workshop and Transmission Demonstration. The two day technology workshop followed by a two day transmission trial and field measurement exercise in and around the city of Jakarta, Indonesia (24- 27 September 2012) provided senior engineering executives from the region with up-to-date information on all aspects of planning and digital radio implementation of DAB+, its transmission technology and demonstrated its enhanced features and efficiencies compared to analogue FM broadcast. Key findings from the workshop and demonstration include a set of recommendations for broadcaster and regulators to consider when planning the digitalisation of radio in their countries. These recommendations are available from the WorldDMB Project Office. The organising committee would like to acknowledge the significant support provided by WorldDMB members, Factum multiplexers, Harris transmitters, Radioscape monitors along with chipmaker Keystone and receiver manufacturers Pure and Revo. Appreciation also goes to Australian antenna systems specialist RFS and their Indonesian partner Megatech who helped get the four RRI services on air in DAB+. This entry was posted on October 25, 2012 by WorldDAB in Asia Pacific, Benefits of Digital Radio, Business Case Studies, Content and Services, Digital Radio Rollout, Events, Marketing, Spectrum and Regulation.